Anyone wishing to come and join us for these events is welcome to do so. Please just let us know ahead of the day. This gathering represents the start of our involvement in the “Cauldrons & Furnaces” Cultural Olympiad events in Wales. We are meeting at St. Mary’s Church at New Radnor at 11.00am. and then visiting New Radnor Castle where we will remember the visit in March 1188 of the Archbishop of Canterbury, recorded by Gerald of Wales (Geraldus Cambrensis) who travelled with him throughout his journey through Wales raising an army for the Third Crusade. At New Radnor, Einion o’r Porth, Prince of Elfael (in whose lands Radnor was situated) took the cross in the presence of his father-in-law The Lord Rhys ap Gruffudd, Prince of Deheubarth. A picture of Einion o’r Porth’s effigy from his original tomb at New Radnor can be seen on the ‘Monuments & heritage’ page of our website. At New Radnor Castle, our party will include people directly descended from the Mortimers of Wigmore, ancient enemies of the family of Elystan Glodrydd. In view of the year and to chime with the cultural olympiad events, we shall declare a symbolic Olympic Peace with the Mortimers, just as the ancient Greeks declared such a truce during the period of their Games at Olympia. We will then follow the journey of the Archbishop and his party and walk to nearby Castell Crug Eryr, just beyond the borders of Elfael. Gerald records that there they met Einion’s first cousin Maelgwn ap Cadwallon, Prince of Maelienydd, who also took the cross. 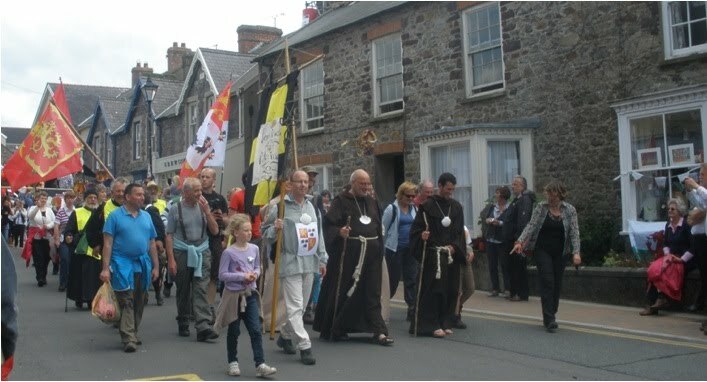 Later in the day, on completing our walk and lunching at a nearby pub, we will complete the day in Llanbister, continuing the theme of taking the cross. One of the follow-on actions from our gathering in 2010, when we celebrated ‘Elystan Glodrydd 1000’, was to have a new processional cross made for St. Cynllo’s. 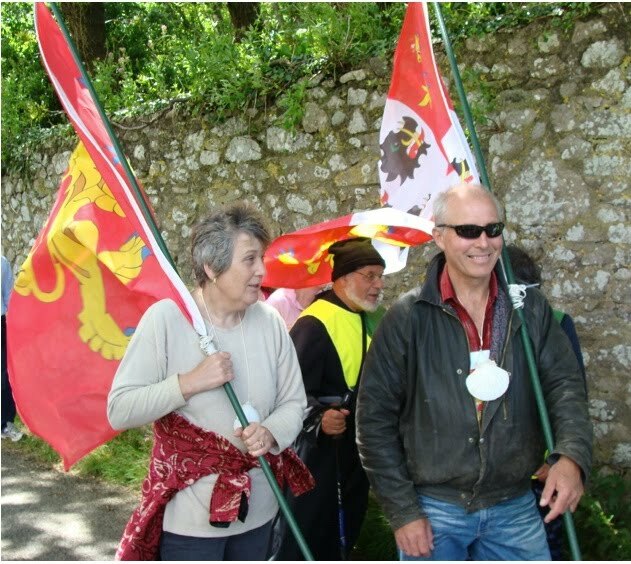 The reason is that when we searched for the church’s cross to lead the procession through the village, none could be found and we were saved by a loan of a lovely wooden one by the local school. We thought it would be a fitting way to remember that happy and memorable historic gathering by presenting St Cynllo’s with a new processional cross as a gift from Llwyth Elystan Glodrydd, The 5th Royal Tribe of Wales. The Elystan Glodrydd Trust, a small charity set up and supported by members of this Welsh tribe, has funded the creation of the cross as part of its work. The cross has been modelled on a stone carved cross from the time of Elystan and has been made by the well known and gifted sculptor and blacksmith David Petersen from St. Clears in Carmarthenshire. It will be presented and dedicated at a special family service on Easter Saturday, 7th April at 6.00pm. 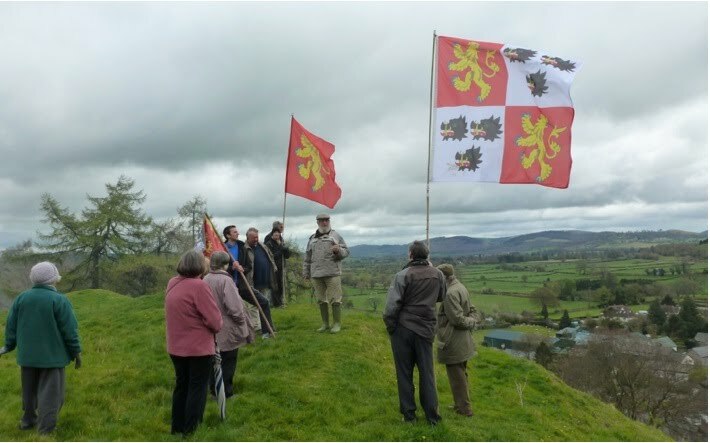 David is giving a talk about the making of the cross organised by the Abbey Cwmhir Heritage Trust, 7.30pm Tuesday 3rd April at Crossgates Church Hall, Radnorshire. Everyone is welcome to attend and refreshments will be provided - a collection will be taken for the Abbey Cwmhir Heritage Trust.